Few artists have explored and painted the landscapes of North America, the Caribbean and Europe as extensively as Albert Bierstadt. Bierstadt would later use the rapid yet detailed sketches created during his travels as sources of inspiration for his monumental landscape paintings. Today, paralleling his own travel experiences, Bierstadt’s paintings can be found in collections ranging geographically from Europe to California and even the U.S. Capitol. Born in Solingen, Germany, near Düsseldorf, on January 7, 1830, Bierstadt was the fourth son of Christina M. Tillmans and Henry Bierstadt. At the age of two, Albert and his family moved to New Bedford, Massachusetts. No records exist of any formal art training in his youth, and it is widely believed that he was self-taught during his formative years. By the age of 20, he advertised himself as a skilled instructor of monochromatic painting. As he was considered an amateur artist, his fee of three dollars per day was extremely self-assured. Doubling as an instructor, he began to exhibit his first works in the small art circles of New Bedford. Realizing that his chances for a successful career as an artist were limited in New Bedford, the young painter traveled to Düsseldorf to further his art education. His mother’s cousin, Johann Hasenclever—a leading painter, had promised to familiarize Bierstadt with the style of the renowned Düsseldorf Academy. Upon arrival, Bierstadt learned of Hasenclever’s death, yet he continued in his quest to learn the techniques of the area’s influential painters. The Düsseldorf School encouraged the use of dramatic lighting and meticulous brushstrokes which together, added a polished finish to paintings. Throughout his career, Bierstadt stayed true to this style, even when the buying public lost interest in his work. In Germany, Bierstadt met and shared a studio with the American painter, Worthington Whittredge. Together, the two artists traveled the European continent. It was the first of many trips to Europe during his lifetime. After returning to the United States, he used sketches made during his trips throughout Switzerland to create Lake Lucerne (1858). 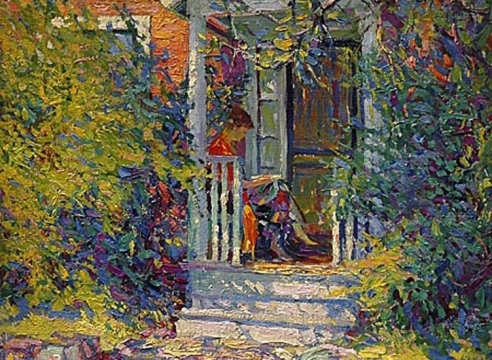 This was his first painting submitted to the National Academy of Design in New York and was shown in their exhibition of that year. Despite lukewarm criticism, he was elected a full Academician of the National Academy of Design in 1860 at the age of 30. In 1859, he joined a road-improvement expedition led by Colonel Frederick W. Lander, and traveled West in the company of several other artists, including F.S. Frost. Prior to his departure, he announced on January 17, 1859 in The New Bedford Daily Mercury that his intentions in traveling west were to “study the scenery of that wild region, and the picturesque facts of Indian life, with reference to a series of large pictures.” Captivated by the West, he ventured there numerous times throughout his life and settled in California for two years. Inspired by this experience and with loads of sketches and stereographs in tow, Albert the traveler returned to New York to create his first panoramic landscape of the American West. 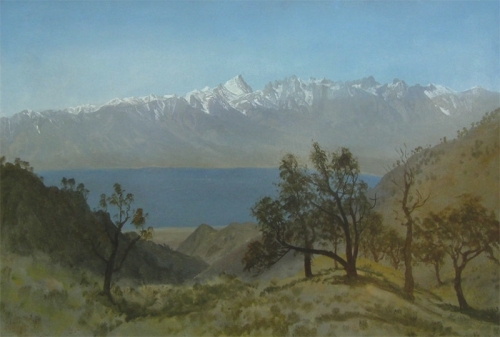 In 1864, The Rocky Mountains, Lander’s Peak was shown at the New York City Sanitary Fair and prompted immediate, international fame for the 34-year-old painter. This event would mark the beginning of his successful, yet short-lived career. In the following years, Bierstadt commanded remarkable sums for his paintings. A stunning $25,000 was paid for The Rocky Mountains, Lander’s Peak. His audiences never refused to pay, and neither did the U.S. government, who commissioned two paintings for the U.S. Capitol. In the peak of his career, Bierstadt built his mansion, Malkastan, on the Hudson River. In 1866, he married Rosalie Osborne Ludlow, the divorced wife of his friend and writer Fitz Hugh Ludlow. 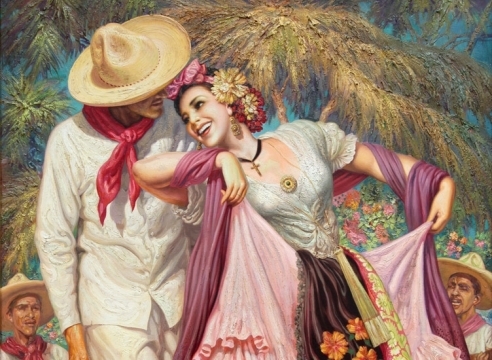 Together, the couple made numerous trips to Europe and traveled to California on the newly accessible Transcontinental Railroad. His wife later became ill with tuberculosis which further prompted the couple to travel to the Bahamas. By the 1880s, both the artist’s career and life began to fall apart. In 1882, Malkastan burned with many of his favorite paintings still inside. After a painful struggle, his wife died in 1893. Although he found comfort in his second wife, Mary Hicks Stewart, he was unable to revive his career. The increasing acceptance of French Impressionism gradually cast a shadow over the efforts of academic realists like Bierstadt. He was quickly forgotten by an audience that had embraced him as a national treasure. He filed bankruptcy in 1895, and died, somewhat forgotten, in New York City in 1902 at the age of 72. Albert Bierstadt is credited as the first painter to truly capture the vastness and rusticity of the American landscape. The monumental size of many of his canvases reflects the nature of the undeveloped lands of the United States that he visited. Each of Bierstadt’s careful brushstrokes works to express the magnificence of the untainted American wilderness which would become a unique part of America’s history. In his early years as an artist, Bierstadt struggled to gain positive support from critics and even his artist friends. Worthington Whittredge noted that Bierstadt’s early works “had nothing in them to recommend [him] as a painter. They were in fact absolutely bad.” This harsh criticism may have been due to the fact that Bierstadt was largely self-taught. Bierstadt’s later success as an artist can be said to have developed in two different stages. It was not until Bierstadt traveled to Düsseldorf in 1853 that his approach to painting would become more developed. As a native of Germany himself, Bierstadt admired the work of the Düsseldorf Academy’s artists and sought to learn their distinct, naturalistic style and precise handling of the brush. Secondly, his extensive touring of Europe, North America, and the Bahamas allowed him to study nature firsthand. Together, these factors were part of what made Bierstadt a skilled landscape painter at a moment in history when the wilderness of America symbolized specific values and beliefs. As art historian Matthew Baigell argues in his epic monograph, Albert Bierstadt, the artist’s paintings of the Rocky Mountains, Yosemite and Indian camps of the Midwest touched an audience who were sympathetic to American Transcendentalism. In the first half of the 19th century, America witnessed the publication of Ralph Waldo Emerson’s tracts on Transcendentalism and his essay Thoughts on Art (1841). A major tenant of Transcendentalism was the belief that if nature was left alone by man, then man could become more easily familiar with God. American painters of the early 19th century shared the same philosophy. Visualizing the tracts of Emerson, the artists of the Hudson River School believed that art could be a medium of spiritual and moral change. American artists like Thomas Cole and Frederick Church loosened their ties with European traditions and frequently sketched from nature. Although much younger than the first members of the Hudson River School, Bierstadt is often grouped under this stylistic rubric. Nevertheless, unlike the other members of the Hudson River School, Bierstadt’s work also displayed an interest in European Romanticism. In Bierstadt’s paintings, the wilderness of the Unites States is transformed into a theatrical stage. However, it is not the occasional figures in the landscapes of Bierstadt’s paintings that capture the viewer’s interest. Rather, it is his “backdrops” of mountainous peaks, gushing waterfalls, and seemingly endless valleys that leave the viewer truly enchanted with the sublime or awe-inspiring nature of America’s frontier. Much of Bierstadt’s oeuvre speaks to a time lost, when the West and California were uncharted territory and when individuals began to take hold of the beliefs of Manifest Destiny. Bierstadt’s paintings invited the viewer to explore and settle the West. As individuals were creating the history of a young country, Bierstadt was documenting it with a naturalistic eye that never ceased to look away even when his painterly style began to fall out of fashion. Hirshborn Museum and Sculpture Garden, Washington, D.C.
U.S. Capital Art Collection, Washington, D.C.
1878 A second and final painting is purchased by the U.S. government. 1. Anon. 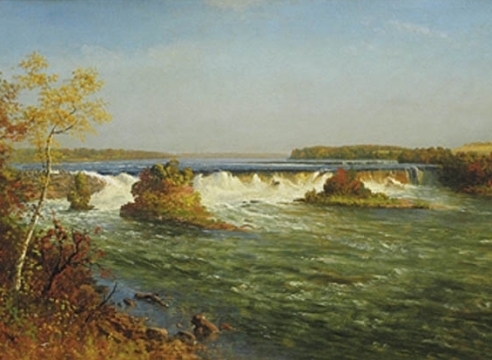 “Albert Bierstadt.” http://www.pbs.org/wnet/ihas/icon/bierstadt.html. 2. Anderson, Nancy K. Albert Bierstadt: Cho-looke, The Yosemite Fall. San Diego, CA: Tinken Art Gallery, 1986. 3. Anderson, Nancy K. and Linda S. Ferber. Albert Bierstadt: Art and Enterprise.New York: Hudson Hills Press, 1990. 4. Baigell, Matthew. Albert Bierstadt. New York: Watson-Guptill, 1981. 5. Baigell, Matthew and Anthony Reed. Oil Sketches by Albert Bierstadt: 1830- 1902. . New York: David and Langdale Company, Inc., 1982. 6. Carr, Gerald L. Albert Bierstadt: An Exhibition of Forty Paintings. New York: Alexander Gallery, 1983. 7. Hendricks, Gordon. Albert Bierstadt. Fort Worth, TX: Amon Carter Museum, 1972. 8. Hendricks, Gordon. Albert Bierstadt: Painter of the American West. . New York: Harry N. Abrams, Inc., 1974. 9. Hendricks, Gordon. Albert Bierstadt 1830- 1902. . New York: M. Knoedler and Co., Inc., 1972. 10. Kennon, Donald R. The United States Capitol: Designing and Decorating a National Icon. . Athens, OH: Ohio University Press, 2000. 11. Leavitt, Thomas W. Albert Bierstadt 1830- 1902. . Santa Barbara, CA: Santa Barbara Museum of Art, 1964. 12. Robotham, Tom. Albert Bierstadt. . New York: Crescent Books, 1993. 13. Page posting on Web commenced July 12 and completed July 15, 2006.